A 1926 biographical sketch of the Col. in the "Niagara Falls Memorial Commssion" listed him this way. 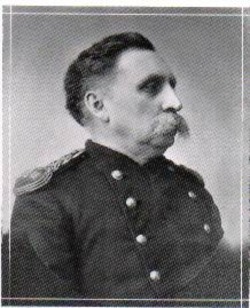 Col. Charles B. Gaskill was one of the notable men of Niagara Falls, and Niagara County. His sphere of influence, however, was far wider, connecting him with activities and enterprises of national importance. Whether considered as a military leader, or as a far-seeing, able business man and executive, few men of his time brought more distinction to his native state, or have greater claim to have his memory gratefully recalled. Charles B. Gaskill was born in the town of Wilson, Niagara County, NY, November 28, 1841. Pioneer surroundings in his boyhood, gave him more meager educational opportunities than were offered in older settle communities, and this fact made more remarkable his first business enterprise, the issuance of a newspaper, the Niagara City Herald, first published by Nathan Hackstaff in the village called by that name, previously Bellevue, and later Suspension Bridge. Colonel Gaskill's life was so long identified with military matters, that to get the true measure of his character, one must go back in national history over 65 years. At the outbreak of the Civil War he volunteered as a private in the 44th New York Infantry, and , although but a stripling of 20 years, his military qualifications secured early recognition and in December, 1861, he received a commission as second lieutenant, and subsequently as first lieutenant in the same regiment. In the battle of Gaines' Mills, on June 22, 1862, the your officer was seriously wounded, and was captured by the enemy a day or two later at Savage Station, VA., a month elapsed before he was exchanged, his wound in the mean time receiving meager attention. After exchange he was sent to a hospital in Baltimore, but months elapsed before he could re-enter the service. On March 27, 1863, he became a captain in the 78th United States Colored Infantry, afterward becoming lieutenant colonel and colonel of the same regiment, seeing active service throughout the rest of the war. He was honorably mustered out of the service on December 31, 1865. He had been brevetted major for meritorious conduct at the battle of Gaines' Mills, and he was brevetted lieutenant colonel for meritorious conduct at the battle of Fredericksburg. In the interval of peace that followed, Colonel Gaskill embarked in large business enterprises, but when his country once more needed him, in the Spanish-American trouble, he eagerly responded and served under Gen. Nelson A. Miles, in the Puerto Rican campaign, when the expedition captured the island. He was appointed captain of the Port of Ponce and had charge of harbor transportation, lighthouses and pilots. After the close of the Civil War, Colonel Gaskill married and settled on a plantation in Mississippi, but in 1866 he re-entered the army, becoming a commandant at Jackson barracks, New Orleans, and also commandant at Fort Mason, in North Carolina. He acted as assistant adjutant general of the district of North Carolina under the reconstruction acts, Gen. Miles being the commandant of the district. Additional military distinction attaches to the memory of Colonel Gaskill because of his deep interest in State military affairs. In 1885 he organized the 42nd Separate Company of the National Guard of the State of New York, in Niagara Falls, becoming its first captain, and this organization through his inspiring and efficient management, became the crack separate company of the State body. In 1870 Colonel Gaskill resigned from the U.S. army service and shortly afterward returned to Niagara county, settling his family at Niagara Falls, and was enthusiastic over contemplated enterprises. In 1861 the hydraulic canal had been completed, but the Civil War prevented any use of it for manufacturing purposes, and it was Colonel Gaskill who built the first flour mill in 1875 that utilized the water of the canal, this mill being the foundation for what was for many years the Cataract City Milling Company, which was recently purchased by the Niagara Falls Power Company and discontinued in order to use the water power to a better advantage. From that time he participated very actively in the commercial development of Niagara Falls. Colonel Gaskill built a pulp mill with the Pettebone Paper Company, and, like the Cataract Milling Company, was only recently purchased by the Niagara Falls Power Company and discontinued so as to make better use of the water power that it took. He was one of the first to recognize the merit in the Thomas Evershed plan for harnessing the Falls, and he was one of the leading spirits in the group of progressive men who organized the Niagara Falls Power Company. Of this company he bacame the first president, and it was to a considerable extent due to his indefatigable efforts in the face of great discouragement that financial aid was obtained that made possible this great enterprise, and he continued wit the company until William B. Rankine had taken the lead and the success of the undertaking was assured. Among other enterprises of great importance to Niagara Falls was the establishment of modern systems of transportation. He was foremost among business men who took over the old horse car line, in the villages of Niagara Falls and Suspension Bridge, and converted it into safe, modern, electric railroad. For several years he served a president of the Niagara Falls and Suspension Bridge Railway Company. Late in the 1880's Colonel Gaskill accepted the presidency of the village of Niagara Falls, although in his busy life of constructive work, politics as a leading issue, had never greatly appealed to him. He was intensely interested, however, in the welfare of his community, and his administration of the presidential office was marked by firm enforcement of law and order. Later, some years afterward when cityhood had been established, he served several years on the Board of Education, and to his initial efforts the school teachers of the city are indebted for the pension system. After his return from the Civil War, Colonel Gaskill was united in marriage to Helen I. Sherwood of Niagara Falls, who passed away in 1903. They had three daughters, namely; Cora M., who is the wife of Morris Cohn, one of the leading attorneys of Niagara county; Flora B., who is the wife of George F. Nye, a prominent business man of this city, and Miss Alice B. As indicated, Colonel Gaskill was concerned in gigantic enterprises that required heavy capital and more than once his own private fortune, which was considerable, was placed as an available resource, and it was in the aftermath of the panic of 1893 that he practically lost all he had accumulated. Ill health followed loss of fortune, but his spirit remained unbroken although physical weakness fell upon him after a paralytic stroke. he retained his mental faculties, however, took keen interest both as a military man and patriot in the progress of the Great war and in illness and weakness as in strength, took kindly thought for others as long as life continued. He was in his seventy-eighth year when his death occurred on Oct. 8, 1919 at Memorial Hospital, Niagara Falls.